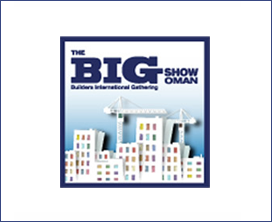 It features an extensive range of the latest building materials, construction equipment, wood machinery, interior furnishings and other products, equipment and technology for building and construction operations The BIG Show (Builders International Gathering) is an annual international exhibition that caters to the building and construction industry in Oman, the Middle East and global markets. It features an extensive range of the latest building materials, construction equipment, wood machinery, interior furnishings and other products, equipment and technology for building and construction operations. It was launched as Interiors and Buildex in 2002 and rebranded The BIG Show in 2010 to further strengthen its image and market positioning. In 2009, it was given recognition as a "UFI-Approved Event" by UFI-the Global Association of the Exhibition Industry. A comprehensive exhibit of the latest innovative products, services and equipment, and featuring country and product pavilions.